Ariane 5 lifts off from the Spaceport carrying a record payload mass with its Yahsat Y1A and Intelsat New Dawn satellite passengers. Bouncing back from a last-second countdown abort in March, an Ariane 5 rocket smoothly ascended into space Friday with communications satellites destined to serve the Middle East and Africa. The 165-foot-tall rocket rose away from the launch pad at 5:37 p.m. EDT (2137 GMT) Friday, climbing into partly cloudy skies over the French-controlled Guiana Space Center on the northeast coast of South America. Powered by twin solid rocket boosters and a hydrogen-fueled main engine, the Ariane 5 surpassed the speed of sound in 42 seconds. After shedding the solid motors, the rocket's core stage accelerated to a velocity of more than 15,400 mph and an altitude of 104 miles in the first 9 minutes of flight. A cryogenic upper stage next fired for more than 16 minutes before releasing the Yahsat 1A and Intelsat New Dawn satellites. The rocket was targeting a geosynchronous transfer orbit with a low point of 155 miles, a high point of more than 22,200 miles and an inclination angle of 6 degrees. Controllers established radio contact with both payloads in the minutes following spacecraft separation. It was the second mission of the year for Arianespace, following the flawless launch in February of the European Space Agency's Automated Transfer Vehicle, a robotic resupply craft for the International Space Station. The Ariane 5 rocket starts its main engine about seven seconds before liftoff to give computers an opportunity to gauge the launcher's health. Once the rocket's solid-fueled boosters light, the vehicle is committed to flight. Officials rolled the 16-story rocket back to its final assembly building in early April, replaced several actuators, and returned the launcher back to the pad Thursday. The rocket first deployed the Yahsat 1A satellite, followed more than 7 minutes later by the separation of Intelsat New Dawn. "Yahsat is a hybrid satellite system that provides commercial and government satellite services in the Middle East, Africa and Southwest Asia," said Jassem Mohamed Al Zaabi, CEO of Yahsat. "The launch is probably one of the most important milestones in our project," Al Zaabi said. "This is when our project becomes operational. This is when we start fulfilling the requirements of our clients -- military and commercial clients. So it's definitely one of the most important phases of our project." Yahsat 1A is the first of two identical satellites. Yahsat 1B is scheduled to launch on a Proton rocket later this year. "Yahsat 1A is the first of two start-of-the-art dual-mission satellites," said Reynald Seznec, CEO of Thales Alenia Space. "Its advanced design means it can handle new technologies and offer the most effective solutions. It is the fruit of winning partnerships between Yahsat, the UAE armed forces, our colleagues at Astrium and ourselves, Thales Alenia Space and Thales." 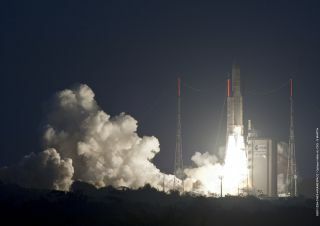 Intelsat New Dawn rode in the lower position during the Ariane 5's ascent into orbit. Once Yahsat 1A deployed, the rocket jettisoned a Sylda dual-payload adapter to make way for the Intelsat satellite's release. "The satellite will not only deliver crucial services specifically tailored for Africa, it will also herald the dawn of a new era where Africans enjoy far greater involvement in the space communications industry," said Andile Ngcaba, chairman of Convergence Partners, leader of the South African investment group that paid for the satellite. Intelsat New Dawn is one of four satellites Intelsat is launching between 2010 and 2012 to bolster the company's presence in Africa. "Intelsat and the African continent share a 40-year history in the development of Africa's telecommunications infrastructure," said Dave McGlade, CEO of Intelsat. "Intelsat New Dawn will be integrated with the resilient Intelsat fleet, allowing us to expand and enhance the vital communications services that are provided by our customers to business consumers throughout Africa." The next Ariane 5 launch is slated for May 19 with the ST 2 and GSAT 8 communications satellites to serve Southeast Asia and India.